Located on a hillside in Pointe Milou, Bonbonniere Villa has great views of the sea and surrounding Caribbean landscape. The villa features one bedroom with an en-suite bath, as well as an additional bath area in the loft. The home is roomy with an open floor plan and fully equipped kitchen, living, and dining area. Outside, there is an infinity pool situated on a large terrace where guests can sunbathe or relax outdoors. There is an additional table and chairs on the terrace for alfresco dining. Bonbonniere Villa is also fully air-conditioned for your comfort and just minutes from in-town activities. Bonbonniere Villa is a hillside villa, located in Pointe Milou and overlooking the ocean. This private retreat has great views from the pool and terrace. A garden path leads to a private courtyard with a lavabo and a table for two situated under a trellis and ideal for outdoor dining. Just inside is a well-equipped kitchen with a bar and a dining area. The newly decorated living room has a flat-screen TV and comfortable furnishings. It opens to the terrace with its infinity-edged pool and a private sun deck. The bedroom and its en-suite bath are very chic. This room also opens onto the pool terrace and shares the great water view. One of the villa’s most unique features is the second bath. Located in an open loft, it has a rain head shower, a glass vessel sink, a private WC, louvered storage space, and a dressing area complete with a day bed. 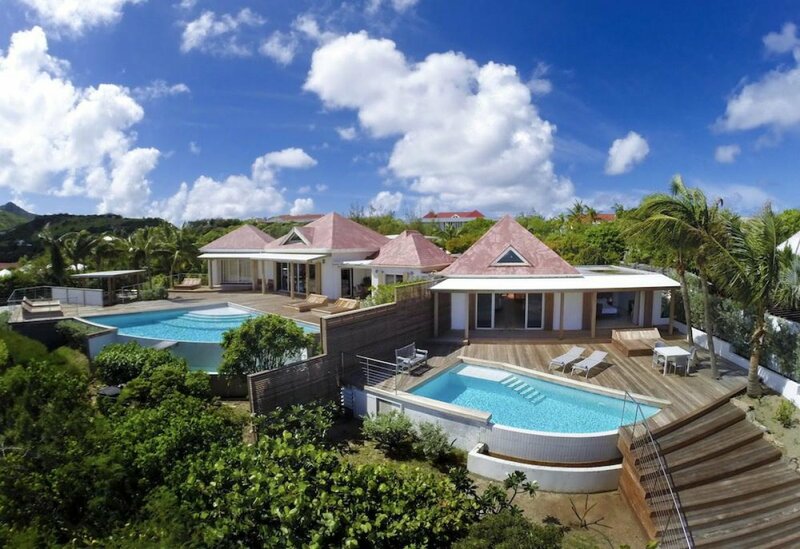 Villa Bonbonnière is within walking distance of the always fun Ti St. Barth restaurant. No smoking in the villa. Gas BBQ, No dishwasher in villa. Villa Bonbonnière can be rented with Valentina villa for 5 bedrooms. A door on the back of the villa allows access to Valentina villa. Bonbonniere Villa is a sweet little romantic hideaway. The new pool deck is lovely. The interiors are an updated Indonesian inspiration. The walk-in showers are big enough for two. The french stove is a pleasure to cook on. If you do decide to turn on the TV the Direct TV selection is complete with movie and music channels. The WIFI is fast. It’s location on Pointe Milou is in a wonderful residential section. It is a very short drive to Lorient, Saint Jean, and Gustavia. Margeaux and Giovanni come in daily to tidy up. They are very nice. The local villa manager calls and checks in to make sure we are happy and to see if we need anything. We have used WhereToStay and Shawna exclusively over the years. They have located villas for us in many different countries. We have never been disappointed. We recommend both to anyone who asks about our vacations.